It’s been a while since our last post on PlayStation.Blog, but we’re back with exciting news: the PS4 release of Ironclad Tactics has been confirmed for early 2015! 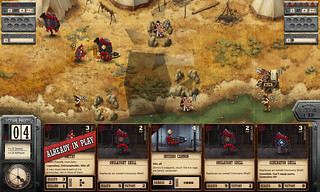 In case this is the first time you’re hearing about it, Ironclad Tactics is a fast-paced, card-based tactics game set in the American Civil War… with robots! Although it’s reminiscent of the tactics games and collectible card games that we’re all familiar with, we’ve done a lot to make it fast-paced, streamlined, and completely free from microtransactions. It’s also completely co-op enabled, allowing you to easily switch between playing solo or with a friend over the internet. The exciting news doesn’t stop there, though. 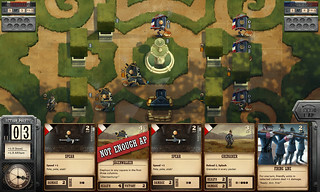 When Ironclad Tactics releases on PS4 in early 2015, it will include all of the add-on campaigns available for the game. You’d normally have to pay for those! Explore the untold backstory of Dmitry in Ironclad Tactics’ first add-on campaign, Ironclad Tactics: The Rise of Dmitry. With eight new missions, including the six-stage “Fort Phantom Ridge” gauntlet mission, you’ll unlock up to eighteen new cards, including Dmitry’s fearsome army of transforming ironclads! 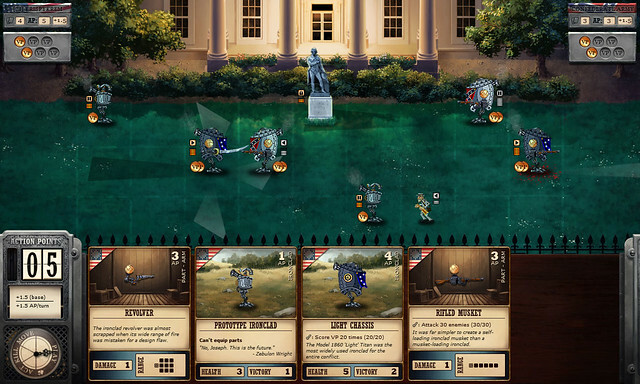 The steam-powered automatons of the American Civil War make their way to Europe in Ironclad Tactics: Blood and Ironclads. With eight new missions, two new full-sized armies, and a challenging WAR! mode, you’ll unlock up to twenty four new cards from the French and German Empires! We’re super excited to be bringing one of our best games to the PS4, and hope you’re looking forward to it too. Robot Monpiece! This is best on Vita. lol thats an interesting way of viewing this game. It takes the fun card combat of Monster Monpiece, but none of the cliche japanese fanservice that i’ve gotten bored of. It also has robots, so its win/win for me. errrrrrr, someone delete this and one of my other posts….. stupid site hanged and didn’t show the first one even after refreshing it. I am always interested in video games that have board game like mechanics to them since I love playing both. If you had used a hex grid instead of squares I may have actually swooned like a proper Southern belle, but this still looks fantastic to me. When you first announced this game for the PS4 I added to my “Top 5” must have games. I’m so pumped for this game. I wanted to ask, now that the PS4 allows “Dynamic Themes” as well as “Avatar Pictures” would you consider on making both and having available at the time of the launch of the game or before? It would be cool to have several of your Dynamic Themes and Avatar Pictures to choose from. but don’t really care if this game never makes its way over. Already have enough shovelware, and the Indies I have bought are more than enough. 1-2$ , and its a maybe. Would really like an improved version of this genre though. Yu-gi-ho Tag was a PSP fav. of mine. I’m really looking forward to this. Looks like a really fun game.